I am Tammy. I recently purchased a Harley Nightster, not only has it rained everyday since, I find myself terrified when I hit the road. Maybe it is because I haven't riden in many years or because I"ve gotten older. This is why I looked up your website. I do not know anyone to ride with so just talking with enthusiasts, I believe will help relieve my fears. It is as blast to start up that bike and head down the road, but white knuckleing it is NO fun. My life was groundhog day. I needed a change. Hey Tammy: I loved reading that there are other nervous woman riders out there. 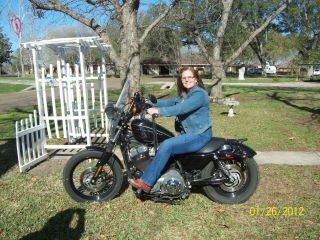 I got my license in 2010 and didn't ride in 2011 after dropping my HD Sportster 883L over in the driveway!. I have a private lesson this Sunday and can't wait to get my confidence back! I think we have all been there. I am going on my 3rd season of riding. I have only put 1,200 miles on my bike so far. My husband surprised me with my bike an Iron 883 Sportster. I love my bike but I wish I would have gotten my license first and then picked out my bike. I kept making excuses not ride. Not this year I am going to make every excuse I can to ride. I am so scared of the idiots on the road not paying attention, on the phone and texting, etc. I did not have a good experience with my first class either. Walked off the second day of class the teacher was a jerk! So I called the school and was able to re-take it and received my license. I am still scared when I first take off and then I seem to relax once I get going. But when I first started I would get a stomach ache because I was so nervous. I have quit smoking and riding and working out are going to be my therapy. I just received the Ride like a pro book and it has some great practice guides in it. The DVD is good also. But I really like the book I can take it with me to the parking lot to practice. Congrats on the new bike. As mentioned, the rider's course is the best thing you can do. When I had the chance to rider the Nightster for an entire week it was a blast! Sometimes I felt like I had a tiger by the tail. Light bike and VERY fast. You will learn your limitations as a new rider and with practice should be fine. Have fun! Thanks so much for all the encouragement and advice. I will soak it all in. I'm scheduled for the riders class next week..It's suppose to rain--The hubs has been so supportive but is not a rider. He wants to buy a bike but I am to inpatient, so off I will go. I hope to encourage others as y'all have me. Be safe out there. Congrats on getting back on a bike. A few months ago I also started riding again after a 25+ year hiatus and, yes, it was terrifying. But it was so worth it. The hardest thing for me was that what I used to do so effortlessly I would now think, think, and over-think. The only cure for this is seat time. Every time I ride I do it better and feel more comfortable. The best advice I have is advice I got from this and other sites like it. Ride your own ride. Those four words say it all! Once you commit to riding your own ride the rest comes much easier. Good luck and enjoy the ride! I started riding in 2009 on a 883 sporster. 12 Days later on my first solo ride, a guy just didn't see me and pulled out in front of me and nearly did me in. My bike was a goner. It took a little while for me to get back on, but 5 months later I bought a 2003 Road King and at first, I was scared to death. I didn't think I would ever ride again, but with the urging of my husband and friends, I am riding almost everyday. Only time I don't ride is when it is raining. I ride to work every morning at 3 am. and it is soothing to be on the road with the wind in my ears and the feeling of freedom. So, take it one day at a time, find your courage, it is there. Keep the shiny side up, watch around you at ALL times, be aware of your sorroundings at all times and most importantly, Have FUN!!!!!!! Find someone to ride with you, that always helps. Good luck. I also took the riders edge class and loved it. The first time I took off to ride by myself I was terrified. First ride by myself was on my 08 Springer Screamin Eagle. I, like you white knuckled it to. Relax and the more you ride the more comfortable it will be. That was 3+ years ago. Nothing can stop me now! Take a class for it to come back faster! They know what they are doing! I started riding again about 3 yrs ago. I hadn't ridden on my own in over 30 yrs. I bought my 2000 Honda Shadow 1100 while recuperating from a scooter wreck. Celebrated my 60th on a ride in the Black Hills. Just take your time and relax, it will come to you before you realize it. The best way to get the cobwebs out. Keep the shiny side up! I would def start off with baby steps. I bought my first bike last June. I have a 883 Sportster. I took the riders course which I learned so much from. I got SO much out of that coarse. But have to admit that first ride by yourself is a little scary!! LOL So I would ride short rides at first and just adding a little more distance with the more confidence I was gaining. My favorite ride was in August where we rode Needles Highway in SD. Ended up riding about 2200 miles last summer, and each ride I gained alittle more confidence. Enjoy the ride!!! Lifes to short not too!! Tammy, congrats! If it's been a long time since you've been riding, just take it slow. Don't push yourself past your limits but do ride as often as you can - the more you ride, the more comfortable you'll become. As long as I've been riding (over 30) and as comfortable as I am, I still get butterflies which helps keep me in check. When you ride with others, stay true yourself and within your own comfort zone and you'll stay safe. Relax and enjoy the ride ! !